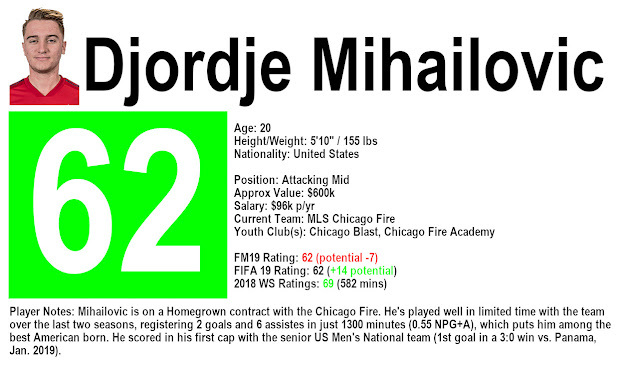 Djordje Mihailovic was the first to score in a game for new USMNT coach Gregg Berhalter. Most likely never heard of the player before he was chosen to start, so who is he? How did he get on Berhalter's radar? It likely starts with his father Aleks Mihailovic who is a well respected and well-known coach in the US soccer-sphere. Aleks was a player in the old NASL that turned into a major player in the United States Adult Soccer Association. His son, Djordje, is a chip off that block. After spending time with his father's club (Chicago Blast) as a youth, he moved into the Chicago Fire Academy in 2013 around the age of 14. The Chicago Fire signed him in 2017 on a Homegrown deal where he now makes around $96k a year. At 20 years old, Djordje has played a total of around 1300 minutes in MLS, scoring 2 goals and assisting on another 6 in two seasons. Last year, Chicago only ran him out for 600 minutes where he scored a goal and assisted on another four. Critical to his performance this past MLS season was starting against both Gregg Berhalter's Columbus Crew (August 24, 2018) and Bob Bradley's LAFC (September 29, 2018) where he had a goal and an assist to go along with 2 key passes in a rare Fire win on the season (3-1). Djordje has a 0.54 non-penalty goal + assist (NPG+A) metric within 1300 minutes of MLS play. For a 20-year-old from Chicago, that is impressive. This past season his 1 Goal, 4 Assists (0.77 NPG+A per game) was the highest by an American with over 500 minutes. At his age, the position he plays and that type of production it would have been hard for Berhalter to not bring him in. It's a positive sign that players like Djordje are getting a closer look. This may sound overly simple, but it means that at least someone is looking. It's hard not to put an asterisk on that because of who his father is, but a positive sign, none-the-less. Berhalter put him in an attacking position up top. Not too terribly different to how he once deployed Ethan Finlay when he was with the Crew. It worked. He went out and played well.